Twitter: Love it, hate it. Even the biggest Twitter critics have to agree that the social messaging service must be doing something right. Yes, there is lots of automatic messaging going on and spam, lots of spam. But underneath that pile of junk, you find valuable information. New product and software releases for instance, or direct conversations between celebrities and fans. 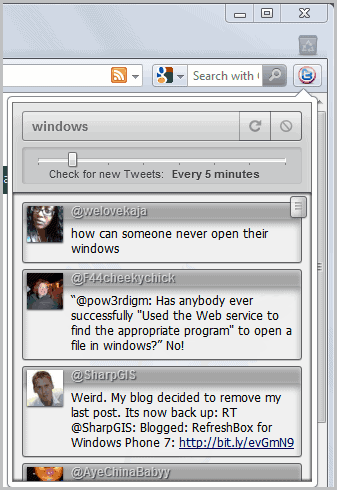 TwitterSearch is a handy Twitter extension for the Opera web browser. It combines search with notifications, which makes it a powerful extension for Twitter users, and those who monitor Twitter for news. The extension adds a single button to the Opera address bar. A click on the button triggers the search form. Just enter a search term into the form and hit the enter key afterwards to search Twitter for that phrase. The latest hits are displayed right in the same interface, no need to go to Twitter or another page to read the tweets. Links are directly displayed so that they can be followed directly without having to load the message on Twitter or another website. The Opera extension does not update the search results automatically. A small slider beneath the search form determines if the extension checks for new tweets automatically. Available intervals range from every five minutes to every three hours. The new message count is then displayed directly on the extension's icon in the Opera address bar. Opera needs to remain open for that, but the Twitter search window can be closed. What I really like is the fact that you can interact with the tweets directly. But it is not only the messages that you can interact with. If you click on an author's name, you see all the tweets of that Twitter user in the search results window. If you know the name you can use the from:name search parameter to directly display tweets from that user. What's missing? An option to monitor multiple phrases would be nice. There is also no back button to go back a page, for instance if you clicked on a username in the interface. Opera users can installer TwitterSearch for Opera directly from the Opera extensions repository.